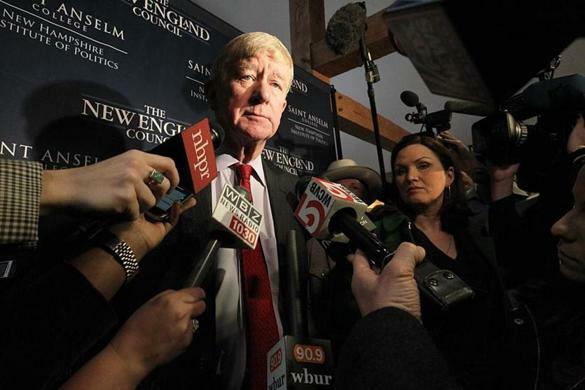 William F. Weld, the former Republican governor of Massachusetts, formally announced his candidacy for president on Monday, becoming the first Republican to launch a primary challenge against President Trump. Weld, who formed an exploratory committee in February, has accused Trump of praising authoritarian leaders, humiliating allies, and railing against the rule of law. He has compared Trump’s immigration policies to Kristallnacht, the 1938 Nazi rampage that destroyed Jewish homes, businesses, and synagogues. Weld was known for his fiscally conservative, socially moderate agenda as a popular Republican governor in Massachusetts from 1991 to 1997. A longtime supporter of abortion and gay rights, Weld endorsed Barack Obama in 2008 and in 2016 declared himself a “libertarian for life,” leaving the Republican Party to become the Libertarian vice presidential nominee. In a campaign video that accompanied Monday’s announcement, Weld described Massachusetts in 1990, the year before Weld became governor, as “a state near bankruptcy” run by a “corrupt Democratic machine.” The spot also features a “Taxachusetts” reference, frames Weld as a crime fighter, and highlights his appointment as US attorney by President Ronald Reagan. The video also includes footage of Trump ridiculing John McCain, mocking a reporter with a physical disability, stating that “Mexico will pay for the wall” and making misogynistic statements. Earlier this year, Weld defended his decision to rejoin the Republican Party after his foray as a Libertarian candidate, saying it was the only way to challenge Trump directly. A graduate of Harvard College and Harvard Law School, Weld challenged John Kerry in a bid for the US Senate during the 1990s. He has run for the governorship of New York and tried to become ambassador to Mexico. He has also dabbled in novel writing and joined the board of Acreage Holdings, a cannabis investment firm. He and his wife, Leslie, live in Canton, according to the campaign. Between them, they have eight children and eight grandchildren. Material from the Associated Press was used in this report. Michael Levenson of the Globe staff contributed to his report. Danny McDonald can be reached at daniel.mcdonald@globe.com. Follow him on Twitter @Danny__McDonald. Previous articlePelosi’s “little gifts of love” murdered 8500 people in the first quarter of 2019, but sure, send them up to us to improve our country. Next articleFill me up anytime!